Confession: I have never been good at taking makeup off at night. I get in the, let's-forget-everything-and-just-jump-in-bed mode. And outside of brushing my teeth (I refuse not to brush my teeth), that's exactly how my bedtime routine goes. I get lazy when I know a soft, comfortable bed is waiting for me. Why add extra time in between teeth brushing and laying my head down on my pillow?! Plus, I've never thought of the long-term damage that I'm leaving for my skin to deal with in the coming years. I've been very fortunate to have great skin that rarely sees a breakout (and when it does I get a single bump or two), doesn't get oily, and doesn't get dry. Because I've never dealt with any issues concerning my skin, I've also never thought about taking good care of it. Besides putting lotion on my body and using an astringent on my face after every shower, my skin doesn't get any additional love. But, I started to take notice of my skin, specifically my face. I was seeing that that my normally tiny pores were getting larger, breakouts were a bit more common, and overall I'm just not giving my face enough TLC. So I began researching, and boy did I find a shocking truth. By not taking my makeup off at night, I'm leaving behind so much residue and buildup that is blocking pores and slowly creating a future issue. I knew I had to break my lazy, nightly habits of leaving all my makeup on, but I wanted to find the right way to go about it, ultimately what would be best for my skin. 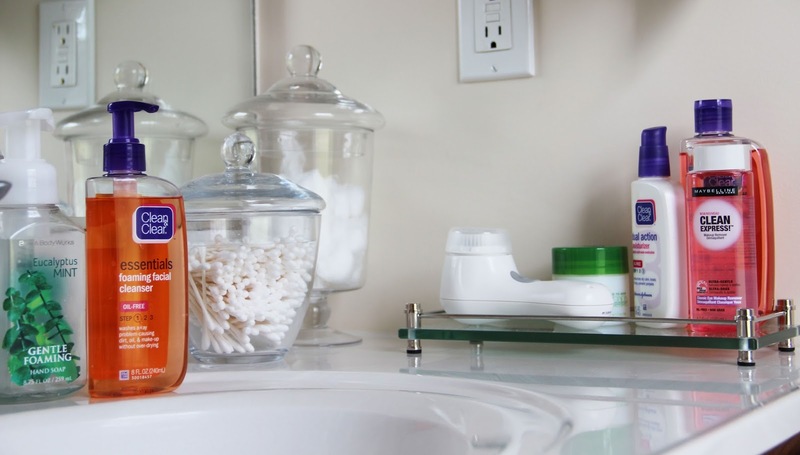 After some recommendations, I landed upon the Clarisonic Mia for a gentle, deep-cleaning tool that would truly wipe off all of my makeup. 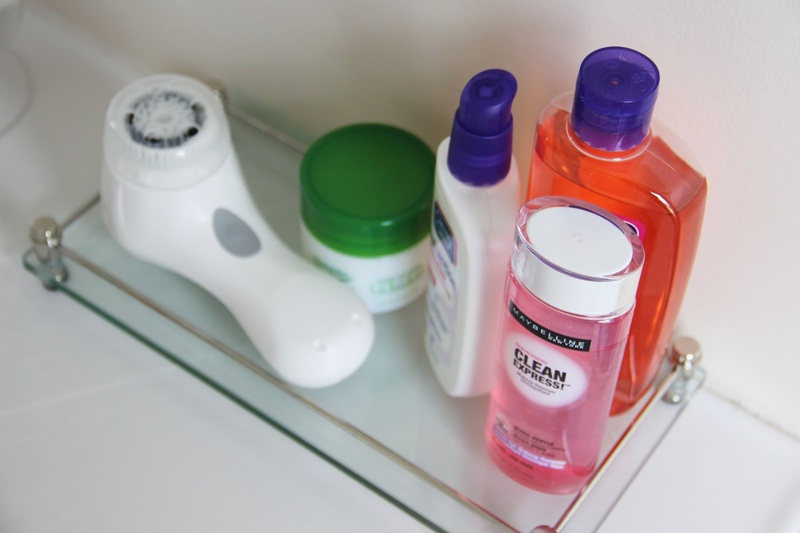 Although, I've heard of some people using their Clarisonic twice a day, I know that it would be too much for my skin to handle. So I've devised a plan that works well for me and my skin. In the mornings, after showering, I use Maybelline's eye makeup remover just to give my eyes a good cleaning and ensure that no mascara nor eye shadow was left over from my cleaning the night before. Then, using a cotton ball, I use Clean & Clear's astringent to wipe my face down, including under my chin and my ears. 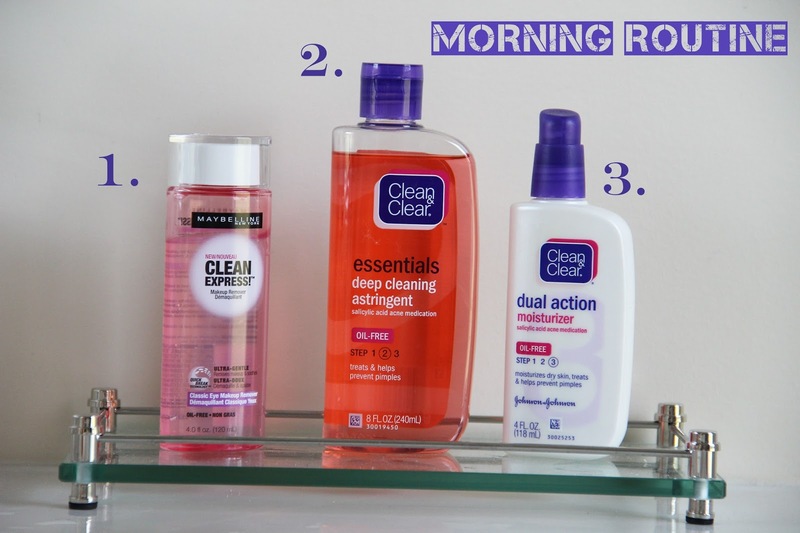 Once my face has dried and my mascara is on, I apply Clean & Clear's moisturizer (I love this moisturizer and have been using it before applying makeup for over 8 years). That's it, that's how I go about cleaning my skin in the AM and giving my face the jump start it needs to take on the day. 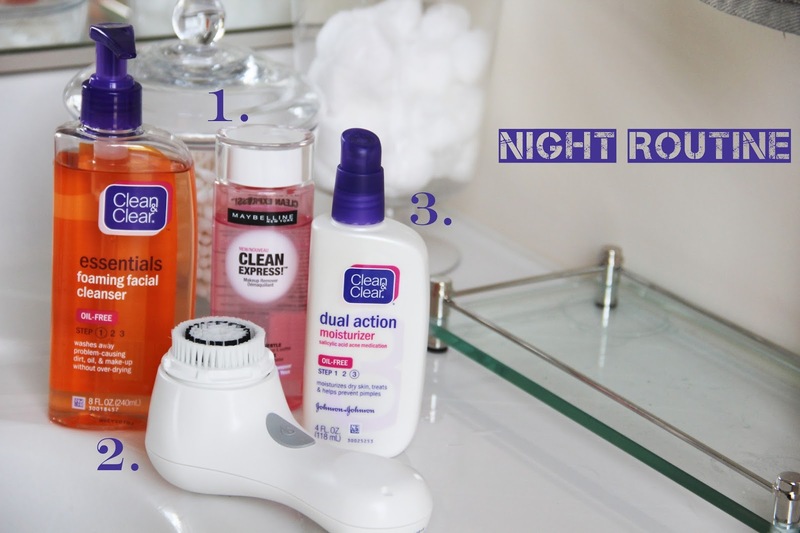 My nightly routine has certainly changed, from doing nothing for my skin to do just about everything for it. I start with removing all my eye makeup with the Maybelline eye makeup remover on a cotton ball. It's important to really get it all off. 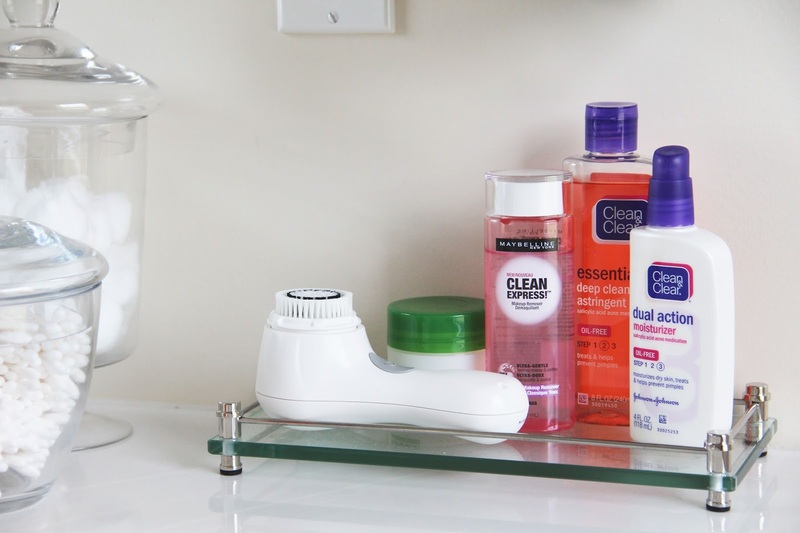 Next I wet my face with lukewarm water, squirt one pump of Clean & Clear's facial cleanser (don't use a facial cleaner with beads, my dermatologist says those are horrible for your skin) on the brush head of my Clarisonic, turn it on, and gently use it over my entire face, including under my chin. The vibrating brush head really works to clear all of the makeup that just using my hands to rub in facial cleanser wouldn't otherwise catch. The Clarisonic runs for one minute and turns off after it's done. I make sure not to press it into my face with force, but gently run it in circles over my skin. Once the Clarisonic has turned off, I rinse my foamy face with lukewarm water and pat it dry. Then I clean the brush head out with water, making sure to get all of the facial cleanser off of it. I then take the brush head off and set it aside to dry, followed by rinsing and towel drying the Clarisonic. I leave both to dry completely until my next use. 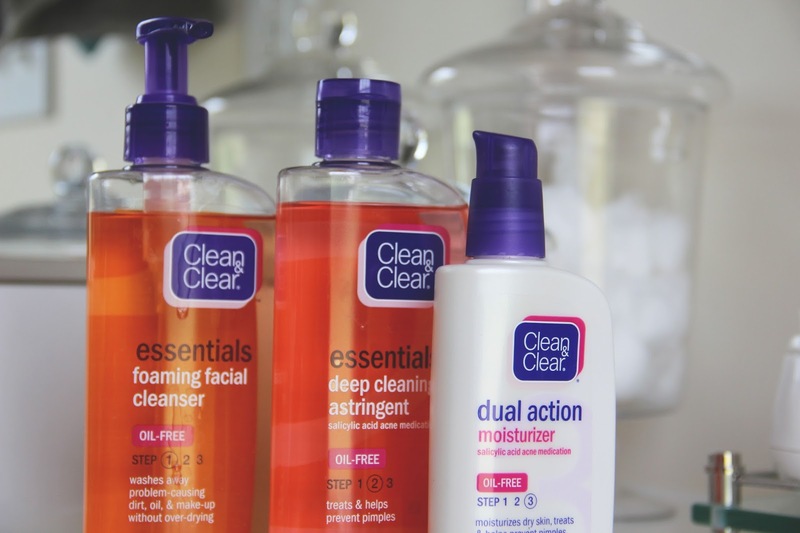 I finish up by using the Clean & Clear moisturizer on my skin. So simple and so worth it. My next goal is to find some really great cream for reducing wrinkles around my eyes and I want to research the benefits of Retin A. I know that I don't have intense wrinkles, but it never hurts to start taking care of them now instead of later. I've learned that lesson already! If you have any incredible skin cleaning tips and tricks please fill me in on them. As I really get this routine going, I want to make sure I'm doing everything correctly and best. So anything you can share, is always appreciated and welcome! p.s. Target has a great deal going on now for a three pack of all the Clean & Clear products I've mentioned.